We're off trick or treating . . . talk to you tomorrow. I don't know if it was the change to Standard Time, or the first serious bit of unpleasant weather (overcast, cool, drizzly) or what, but today has been remarkably uneventful around here. Everyone's got their assignments and are working hard at them, even while trying to fight off the various colds and ailments that are more likely to circulate in the fall and winter. I don't want you to come away from this installment of the Daily Illuminator empty-handed, so here's a cool link for the day: Bright Lights, Big City is the home page of an old friend of mine, a newspaperman named Roy Bragg. He writes for the San Antonio Express-News these days, and puts some of his more twisted column ideas up on the Web. Well worth your time if you like thought-provoking writing that will also make you, on occasion, squirt whatever you're drinking out through your nose. Check it out. Well, at least it was for me . . . Looks like Pyramid #17 is going to the printer today, though a couple of our advertisers are going to be late with their ads. The only thing that keeps me sane sometimes is the thought that somewhere, sometime, there are operations more disorganized and chaotic than us. Not much else going on. Derek and Monica are finishing up the Pyramid details, Susan and Lillian are working very hard on GURPS Celtic Myth, and it will go to the printer early next week. Once these two projects get out the door, we can all take a couple of deep breaths before the next crunch comes. And that crunch has a name: Assassins. Steve tells us from Europe that he's got a card roster he's happy with, and after one more round of brutal playtesting and the final production touches, this INWO supplement can go to the printer! I don't want to make any promises, but it might (I said might ) make it out before the end of the year. But we'll see. . .
``Remodeling'' is probably too strong a word; ``Tweaking'' is more like it. But we've spent a lot of time lately thinking about how to improve and promote Pyramid magazine. The latest issue, by the way, goes off to the printer tomorrow. Nice cover, eh? Anyway, here's what we've come up with. First off, no major, earthshattering changes. We like Pyramid an awful lot just the way it is. But we do want to emphasize a few things that we think have gotten lost in the shuffle lately. Namely, that we are a general-interest gaming magazine. We cover and review lots of different types of games and lots of games from other companies. We're going to run more generic adventures, more material for more than one game system, and remind everybody that the ``G'' in GURPS stands for ``Generic.'' Even GURPS material can be used in other roleplaying systems. And since nobody likes to make changes that nobody notices, we're going to play up our coverage of other games -- for one thing, we're expanding ``Pyramid Picks'' from six pages to about ten. So if you've been giving Pyramid a pass because you figured it was a shameless house organ with nothing but SJ Games material, give us another look. I think you'll like what you see. OK, so here's the deal: We're trying (with varying degrees of success) to get a couple of projects to the printer. Steve Jackson, who checks everything over very carefully and personally before it goes to the printer, is in Europe. What to do? The Internet to the rescue! So as we get art in and put together product covers, we simply scan the stuff in and post it to the web. Then we send Steve the URL via e-mail or fax or whatever, then he dials it up when he gets net access and looks it over. 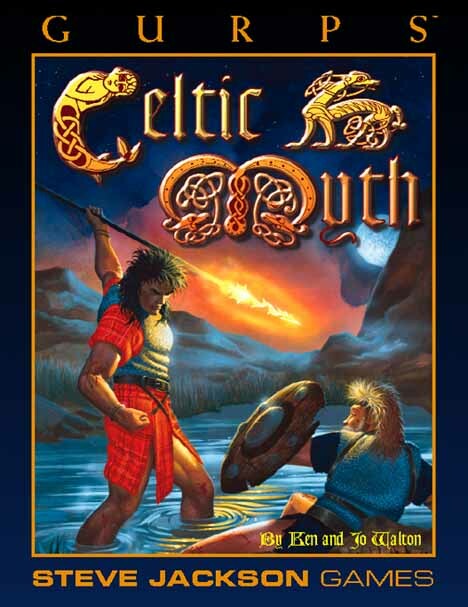 And here is that GURPS Celtic Myth cover, in all its glory. 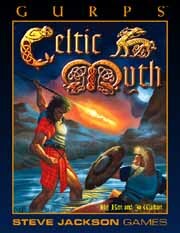 Look for GURPS Celtic Myth on the game store shelves just before Christmas. I love modern technology. ``I'm building a Murphy's Rules Web site and archive (it's starting to fall together -- check it out). As a part of this project, I'm going to be starting work on the history of Murphy's Rules soon. ``But I'm at a loss on some points: If anybody knows what became of cartoonists Richard Mather (the first Murphy's artist) and Michael von Glahn (the third cartoonist), please let me know. I have no idea what they did besides Murphy's, nor what they're doing now (if anything). OK, so it's not quite ``Hell Week'' . . . but it's close. We're fighting tight deadlines on both GURPS Celtic Myth and Pyramid #17, and nobody's going to be in a really peachy mood around here. There is other news, though. We got our phone lines reconnected with the Internet, so now we all have access to our e-mail, our cherished newsgroups and the beloved World-Wide Web. Took me all morning just to get through the e-mail backlog . . . and forget about the newsgroups. Just had to reset the pointers and start over . . . Talked to Steve this morning -- Germany seems to be treating him well. And he had a devious new idea for the special power and victory condition for the Society of Assassins, the new Illuminati group that will be in Assassins, the INWO supplement that will be out soon. I could tell you exactly what he has planned, but then we'd have to send our agents to ensure your silence . . . Car Wars -- Coming to a Mall Near You! Big news, folks -- We've signed a licensing deal with Victor/Maxx Technologies, Inc., one of the leaders in virtual reality programming and hardware, for development of a virtual reality game based on the Car Wars game. Tentatively titled Autoduel, the game will start in location-based entertainment centers (LBEs), and branch out into online gaming and a CD-ROM home game. One ultimate goal of Victor/Maxx is to make all three versions of the game compatible, so that you can play Autoduel at home against players at LBEs at various malls, all in real time! The prototype LBE is scheduled to open in Chicago next summer. For those of you born yesterday, Car Wars was SJ Games' first monster hit, a boardgame with strong roleplaying elements set 50 years in the future. After the Grain Blight caused world-wide famine and most of the oil ran out, civilization as we know it collapsed. The towns that could barricaded themselves into fortresses, and the highways were left to the bandits, the foolhardy and those with no other options. To survive, drivers switched over to electric power plants and armed and armored their cars. The stories of dramatic duels on the highways of a broken country caught the imagination of the public, and soon autoduelling became a televised sport. Car Wars let you design your own vehicles (or use pregenerated designs) and take to the arenas, the highways, or the badlands, taking on all comers with your machine guns blazing. Supplements later added everything from big rigs to helicopters and hovercraft, more and bigger guns, and accessories of all types for customizing the ultimate highway death machine. While Car Wars has dropped a little in popularity recently, a fanatically-dedicated core following has continued to champion this game, playing at conventions, publishing newsletters and running their own tournaments. We're particulary happy for them -- they're going to love Autoduel, and it's their faith in Car Wars that helped make this deal a reality. Obviously, we here at SJ Games are thrilled silly to be involved in such a project. Victor/Maxx is a pioneer in VR hardware and programming, a well-established leader in the field. These babies are going to rock. And our plans are already kicking into gear to take advantage of the new interest in autoduelling this will generate with a new line of Car Wars products. Don't know exactly what or when yet, but the wheels are turning, as it were . . .
Drive Offensively . . . and Drive Virtually! Our phone problems continue, but Jim does have a modem on his machine, so with his help I'll do this the old-fashioned way . . .
Steve reports from the Essen show in Germany that our German-language licensor, Pegasus Games, has two huge booths -- one for sales, and one for demonstrations. They also have four new releases: The INWO Factory Set in German, GURPS Magic in German, their own gaming magazine, Ringbote, and the very first edition of Pyramid in German! I'm told that this is not a direct translation of our English-language version, but Pegasus' own GURPS support magazine with mostly original material. More from Essen as Steve sends us more reports . . .
By the way, I told you guys it would be the Braves and the Indians in the World Series . . . who's going to win? I don't have the foggiest idea, but I plan to have a wonderful time watching. I'm heading to Germany tomorrow, for the Essen game/toy show. After that, I get a few days free in Germany; then it's off to Dublin for Gaelcon. There I'll show off the completed layout for GURPS Celtic Myth and hope they like it . . . if they don't, I'm a long way from home. After Gaelcon, I spend a day in London, during which I will make Secret Deals You're Not Cleared For and maybe visit the British Museum. Then home Nov. 1. Try to stay out of trouble while I'm gone, all right? (And forgive the folks here if you don't see quite as regular a Daily Illuminator as you might like, or if they're slow to answer e-mail. Southwestern Bell took our T-1 down today, without giving us the ISDN line that was supposed to replace it. So the office is Off The Net until Jim improvises something. Bad, bad. The Usenet newsgroup alt.games.illuminati now exists, for discussion of both Illuminati and INWO. According to the official announcement, it also "encourages discussion of various conspiracy theories, how they relate to the Illuminati game, and what bearing (if any) they may have on real life." "Finally, the true purpose of this newsgroup is to [CENSORED]." With many thanks to Jeff Koke, GURPS Greece is now at the printer and looking good for its November ship date. And the cover is gorgeous, too . . . I'll put it up next week. So it's onward to the next crisis, but not before we take some more time to travel the globe. Sales Manager Claudia Smith is on her way to Berkely, CA today for a trade show put on by Berkely Game Distributors. And next Tuesday, Steve leaves for two weeks in Europe! First Essen, Germany, then a little tourist time in the wilds of Germany before moving on to Gaelcon in Ireland. I'm sure he'll tell you more about it before he leaves. With Lego (tm) you can build everything but a life! Ever since our web site went up, it's had a link to the Lego Wars home page, maintained by Todd Ogrin. The game, which he created along with E.O'Dell, is a wicked parody of WH40K, using bits of Lego to create the miniatures you play with. But now, if you hit his site, all you'll see is the story of the letter he got from the lawyers at Interlego A.G. Todd's a student . . . he can't afford a legal battle with a giant corporation, regardless of what his rights may be under the "fair use" doctrine. I really like playing with Lego (okay, I'm childish, but we knew that). I've even (gasp) been known to use it to play games. I have no idea how many hundreds of dollars' worth I have bought over the years. But however much I have right now, it's enough. Until the makers of my favorite toy clean up their act, I'm not buying any more. That may be a long time. The Lego folks are rich, powerful, Politically Correct, and thoroughly hypocritical. They're getting very rich by selling a war toy, and they're ashamed of it. But they get very upset when someone actually writes about playing war with Lego. As Todd found out. And I don't think that's right. Greg Costikyan, as you'll remember, is the designer of Toon, as well as the author of three novels, a lot of short stories, and a couple of online games. He now has his own web page . . . take a look. There's a link to his next project, a very interesting political game. Or is it a game? This might be the way we vote, 20 years from now. Work goes on around here unabated; Jeff is whipping up a juicy cover for GURPS Greece, and I'm editing like mad on Pyramid #17, while Susan and Lillian try to get GURPS Celtic Myth to fit into the required 128 pages. Same old fun. Just in case none of you noticed, one of the greatest post-season baseball series of all time wrapped up Sunday night when the Seattle Mariners came back in the bottom of the 11th to win, 6-5, capping a three-game comeback from an 0-2 deficit to the New York Yankees. This series had it all -- young stars, veterans shining in the spotlight, clutch performances, lead changes, comebacks, great plays. Sadly, no one noticed. The Rockies - Braves series was pretty good, too, with come-from-behind wins every night. Not as good as the Mariners - Yankees, but good. Did anyone notice? Has baseball finally dealt itself the death blow that has been predicted ever since the first player strike in 1981? I hope not. If you like exciting baseball, it might be worth your time to check out the American League and National League Championship Series, starting tonight on a TV set near you. Should be fun. For what it's worth, I'm picking the Indians and the Braves to get past the Mariners and Reds and meet in the first ``Politically Incorrect'' World Series. Nothing to do with SJ Games, so I'll keep it short: Here's a small web site dedicated to amber - not the Amber game, but the gemstone - with some of the most beautiful online photos I've seen in quite a while. I love amber, especially the kind with bugs in it . . . but even if it's just fossil tree sap to you, you might enjoy the pictures. In a bit more than a week, I'll be headed for Europe . . . first to the Essen game fair to meet with Pegasus, the German publishers of GURPS and INWO. They don't have their own web site set up yet, so no link right now . . . when they do, I'll let you know. From there, I'm heading to Dublin for Gaelcon. This is a very classy game convention - I was there a couple of years ago and had a great time. They do have a web page, but I don't seem to have the right http for it. Maybe later. And a distant early warning . . . January 31 to February 3, I will be at Brigham Young University in Orem, Utah for "Life, the Universe and Everything XIV," a symposium on science fiction and fantasy. It should be quite a trip; their other guests include Tracy Hickman and Patricia Wrede. And they have a web page, and I even know where it is . . . so check it out. It works! The official Dedication Party isn't till next week, but I just tried out our new 6-person (more or less) hot tub. It works just fine, thank you very much. It would have taken all the fun out of having a hit like INWO if we hadn't done one insane thing. So we've got a company hot tub. Yes, it's decadent. But it sure is going to take the sting out of those late work sessions . . .
Been kind of a sleepy day around here . . . the GURPS Greece interiors went to the printer yesterday, but the cover painting that we expected in today appears to be a no-show, so a lot of people who have worked way too hard this week already have gone home early to enjoy a lovely, breezy fall afternoon. It doesn't hurt that Austin's premiere science-fiction convention, ArmadilloCon, kicks off tonight at a local hotel and runs through the weekend. Our Art Director, Lillian Butler, is helping out with the art show, and editor Susan Pinsonneault is helping with the filksinging. And most of the rest of us are SF fans at heart -- look for us there. Bob Apthorpe will be joining us, sometime in the next couple of weeks, as our new full-time Webmaster. You'll soon see a lot more SJ Games material online, and it will look a lot better. James Cloos has been doing a great job looking after our web pages, with the time he could purloin from his own full-time job as an IO engineer. And he'll still be around. Likewise, Scott and Jeff and Derek and I, and all the other staff who have been maintaining pages, will continue to do so. The difference is, now we'll have someone whose only job is to help us, train us, and take full responsibility for making the pages both neat and current. And look for a SJ Games catalog on the Web real soon now . .
We saw some bluelines today, including those for Pyramid #16, which seemed like as good a reason as any to put the cover back up for you to check out . . .
We've got four products at the printer right now, and they should all be back in time for our late-October ship date, which will put them on the game store shelves in early November. Pyramid, plus three GURPS books -- the all-new, all-cool GURPS Blood Types, a reprint of GURPS Fantasy with all-new art and a sharp new interior design, and a reprint of GURPS Vampire: The Masquerade, which didn't need any major changes or anything -- we just ran out. They'll be in stores soon, so keep your eyes peeled! Who's Bob Rogers? And why should you care? Well, maybe you shoudn't care. But I care, and since it's my column (at least for today), here we go . . .
Bob Rogers was the head of the Journalism Department at Texas A&M University when I was there in the late '70s. He was also the faculty advisor to Student Publications, the guy who rode herd over all us Carl Bernstein wannabes at The Battalion, the student-run newspaper. His love for journalism and the printed word -- and his incredibly high standards for both -- challenged and taught every student lucky enough to cross his path. In my life, there is a very short list of people without whom I would not be where I am today -- and Bob Rogers is near the very top of mine. Thanks, Dr. Rogers. Just an aside: There is now a Battalion home page on the World Wide Web -- check it out. Back to this weekend, when hundreds of Dr. Rogers' former students returned to Texas A&M to honor him on the occasion of his retirement. It was a pretty amazing weekend, as I saw over a dozen classmates I had not seen since our college days together 15 years ago. And as promised yesterday, I will tell you about my brush with celebrity greatness. Texas A&M's most famous journalism graduate -- Lyle Lovett, Class of '78 -- was in attendance. I knew him slightly in college, but since I was a couple years behind him, we didn't exactly hang out. But it was a small department, and I worked with him on a couple of newspaper stories. He was very gracious and kind in person -- the same sort of soft-spoken sort you see when he appears on Letterman or Leno or in concert. I think he appreciated not being the focus of attention, and being around old friends who didn't think of him as a famous singer or gossip-column item, but just as Lyle from college, the quiet guy who worked at the paper and also sang at the local pizza parlor or anywhere else they'd let him. Back to the game news tomorrow . . . If you missed Friday's Daily Illuminator, it's because we were stunned at the departure of Rick Martin, a production artist we had become very fond of in a very short time. Rick did a lot of great work for us, and you'll be seeing more of his work in the future, as he's now with a firm that designs Web pages for paying clients. Good luck, Rick. Drop by and say hello anytime. Things have been pretty hectic around here, what with the remodeling (again), the potential new employees (more on that when something solid develops), the attempts at hammering out a 1996 schedule (more on that when something solid develops) and the travel. Claudia just got back from the TD Imports trade show in Canada, and I spent the weekend at the ol' alma mater, honoring the retiring professor who is almost single-handedly responsible for my writing career. Saw lots of old friends and had a brush with celebrity greatness -- Texas A&M's most famous journalism graduate returned for the event, and I'll tell you all about it tomorrow. Oh, for those of you who missed out on all those September '95 entries of the Daily Illuminator, you can get caught up by checking out our past columns page. One hint for tommorrow . . . think big hair.